Their first live show was opening up for Bon Jovi. Their first U.S. fall tour opening up for Goo Goo Dolls. Their first U.S. spring tour opening up for Audio Adrenaline. They've been there, they've done that. Helming from the UK, modern rock band Fono now answers a few questions and shares some thoughts on their album Goesaroundcomesaround and their tour with Audio A. This interview took place on: 5/18/00. 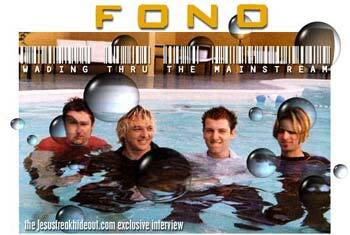 Jesus freak Hideout: What's the story behind the name "Fono"? Del Currie: It means absolutely nothing. JFH: How did the band get started? Del: Ian and I used to play together before so when I started a new band, I gave him a call to call [me] and in the meantime we hooked up with Andy on drums. JFH: How would you describe your sound? Del: People say we're a cross between the Foo Fighters and the Who. JFH: What bands have influenced your sound? Del: I'm a fan of Sugar, Soundgarden, STP, all that U.S. stuff really. JFH: What is the song "Alcatraz" about?? Del: It was actually inspired by the movie Murder in the First. If you watch the movie closely you get the drift of the song. JFH: What inspired the song "Burn?" Del: It's all about passion for life and God. JFH: What is your favorite Fono song? Del: My favorite would be "Alcatraz". It's a very emotional song for me and was really special when we recorded it. The studio was just electric and it's one of the rare occassions that the first vocal take makes it to the master. JFH: You're currently on the Underdog Tour with Audio Adrenaline, Raze, and Riley Armstrong. How is it going? Have there been any highlights for you and the band yet? Del: We've had a great tour. Alberquerqe (or however you spell it), New Mexico was a great show for us. We'd played there on the Goo Goo Dolls tour and the radio station there have been great supporters of ours so it was a great night. There's also the night Will from AA came out and vacuumed the stage during our set?!? JFH: What is your most embarassing moment while performing live? Del: I jumped off a drum riser once and split my pants clean open. I had to leave the stage and get changed. JFH: Do you prefer Mountain Dew or Pepsi? JFH: What cartoon character most reminds you of you? JFH: If a movie was made about you, who would play you? JFH: What is your all-time favorite musical artist? JFH: What does the future hold in store for Fono? Del: Touring, Touring and more touring. 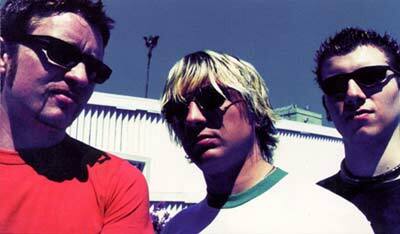 We'll try to do a new record for release in 2001 and we're always working on our mainstream stuff. JFH: I really appreciate you taking out the time in your busy schedule to answer some questions for us. Are there any last comments you'd like to make? Del: Tell your friends about the sweetness of Fono!! Check out sound clips of songs from their albums right here in the Sound Clips section.